I think I’ve made it clear over the years that I am obsessed with Mexican textiles and Mexican Modern decor. On our last cruise together, Jacinda snuck out and bought me a serape to use to re-upholster some stuff I’d been telling her about. I finally got around to it. 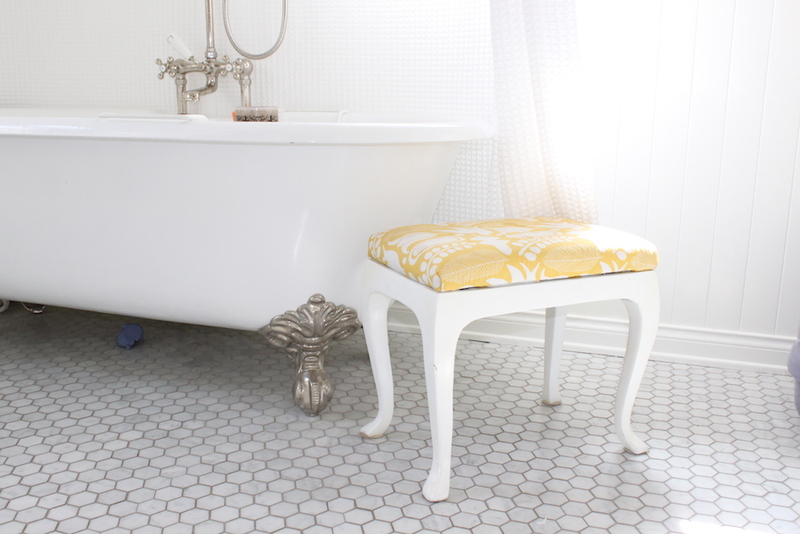 I found this old stool years ago at a flea market and painted it white, then re-uholstered in oilcloth to use next to the bath. It no longer looked that pristine. I think my bathroom looked that pristine for one day, maybe one hour, when I took that picture. I do love the overturned rubber duckie as proof a child lives in my house. So, anyway, I gave the stool’s legs a quick sand with 220 grit paper, and sprayed them with a few fresh coats of white paint. Then I didn’t even remove the old fabric, I just removed the seat and stapled the serape right on top. 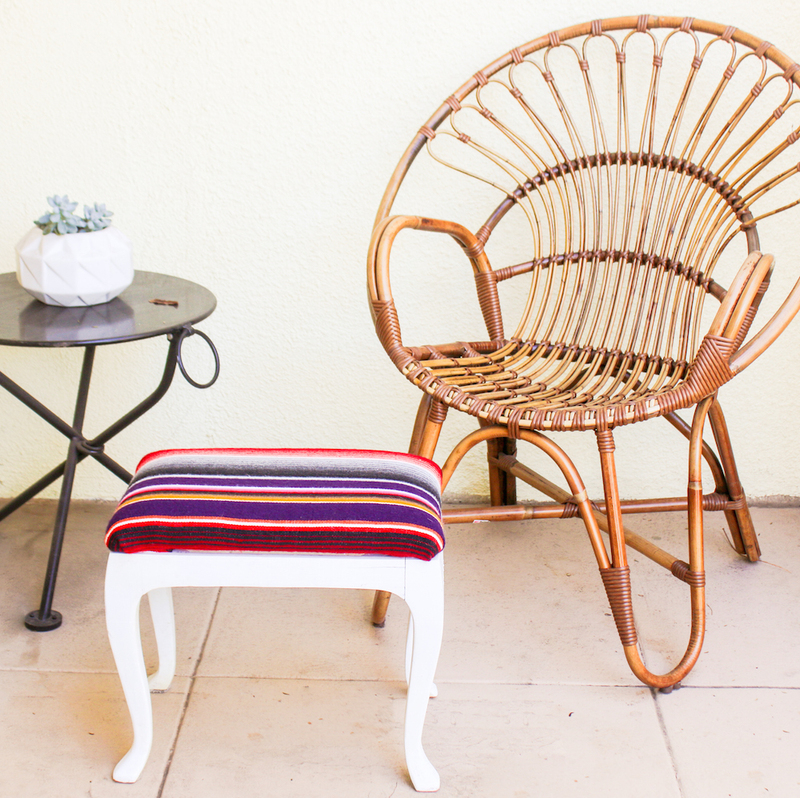 For detailed instructions and step-by-step pictures of how to remove and recover the seat of a stool, check out this post: DIY Ikat Footstool. It’s super easy. Now that Scarlet has moved on to showering, I don’t need the stool to be water resistant anymore, so I decided to re-cover it in my colorful serape. My one important tip for working with serape is that it will unravel once you cut off the selvedges, so you will want to serge the loose edges or coat them in some stop-fray glue (I like Aleene’s Stop-Fraying). 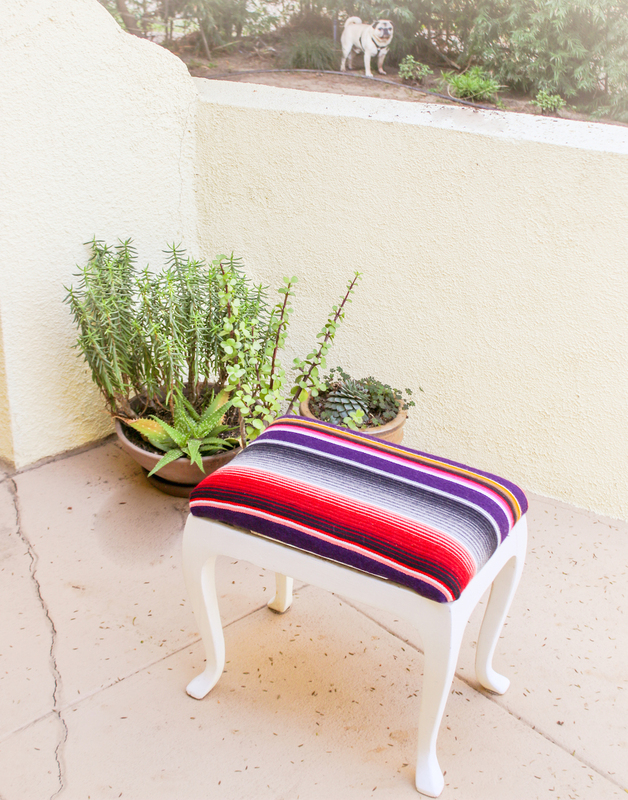 I love my bright serape stool, and now I think of Jacinda whenever I put my feet on it. Awwww.